Green Island Brands, Inc., makers of Clean Air Brand® automotive odor elimination and air quality products began business in 1993 in Palm Beach Gardens FL. The original name of the company; Enviro Motive Products, reflected the desires of the company founder, Todd C. Marshall to create innovative and effective air care products that were earth friendly. Enclosed Automobile, Truck, RV or Boat air quality; just like indoor air quality is constantly threatened by contaminants like mold, mildew, bacteria, food odors, pet odors, smoke odors and more. These unpleasant bad odors and contaminants become embedded in materials like carpet, cloth and vinyl. Additionally, all the bad stuff and odors that you breath, keep recirculating thru the air conditioning and vents. The big question was, how do I eliminate odors from my cars air conditioning system? The Original Clean Air® Duct Freshener was the answer and this product started it all. Up to that point, there were few if any products available directly to the consumer that would easily, effectively and safely clean and freshen a cars air conditioning and vent system. First we developed Clean Air® Duct Freshener with Ease of Application in mind by packaging the product in a simple to use, spray can with clear 3 step instructions. Dear Clean Air, my husband and I own an older model Toyota Pick up and we could not figure out what product was best at getting rid of mildew smell until we discovered your Clean Air Duct Freshener at our local auto parts store. In the past we had tried every product we could find and nothing got rid of our car mildew smell. Clean Air did the trick and our air conditioning system smells clean and fresh now. Thanks for making such a great product. Vickey and Michael D. – Austin Tx. To the makers of the Clean Air Freshener, I wanted to tell you that I bought 2 cans of your product from a catalog and the description said it was easy to use and got rid of odors for a long time. Well they were right and I will recommend Clean Air to everyone I know because almost everyone has a smelly car it seems. Writing to let you know that we used your Genie freshener fogger in our two year old mini van that had the worst car smell you could imagine due to hauling around kids and our dogs. The pet smells were getting pretty bad along with all the spilled food and drinks. Genie really worked the first time and I went back to the store and already purchased 2 more for future use. Glad to have discovered a real odor eliminator. Allison T. – San Diego CA. Thanks for the Clean Air Duct product you sent to us after the Spring trade show. I was not lying when I told you guys that my brand new $ 100,000 RV had a mold smell coming out of the air vents. I took it back to the dealer and all he could do was to tell me to change the filter! It took two of the cans but the next day I noticed the air con smells had completely gone away. Bravo to you guys and keep making more products like the duct freshener. Dear / Clean Air Genie Fogger manufacturers: I had been trying to contact you directly and finally got to your web site and read about how to get a smell out of a car and thought the Genie Fogger looked really different and cool. I found Genie in a store near our house and purchased a can to test it out. Wow is all I can say… I let my husband do it and in 5 minutes my little car smelled like new again. Genie Fogging Freshener must be the best product out there for getting rid of smells. I love it. We want to say that after spraying your clean duct freshener into our air system , my wife and i could not be happier. Over the years i put every type car scent and perfume in there and nothing made my car air conditioner smells stop. Your clean air did it and i will buy more. Great, Great, Great products from your company. We run a detail shop and have a pretty high end clientele as well as high end cars coming thru here. Every customer asks us how to get rid of odor that is coming from their air conditioning heating ducts and just plain old musty car odors and after we tried both your clean air Duct Fresh and Genie Fogger, we have found the solutions. I would rate both your products well above all the over priced, so called professional chemicals we used in the past. Customers are now super pleased and so are we. Hands down the best products we have used ever and I wanted to write to you and let you know that your air conditioning duct Freshener and clean air foggers really zapped out the heavy cigarette smoke odors we have to deal with when the fleet vehicles come back through our system. The fabric fresheners we were spraying in the interiors had too much perfume and odors came back. Both your products eliminate smoke odors and seem to be working long term. Brian C. – Fleet Manager, Volume Auto & Transport Brokers MI. The next question was, how to get rid of odor in car? Clean Air® Auto Fogger is the solution to the problem. We realized that traditional car fresheners were just perfumes and overpowering Cover Ups. All the hanging do dads and stuff you put under a car seat were just temporary and never treated Car Smells. 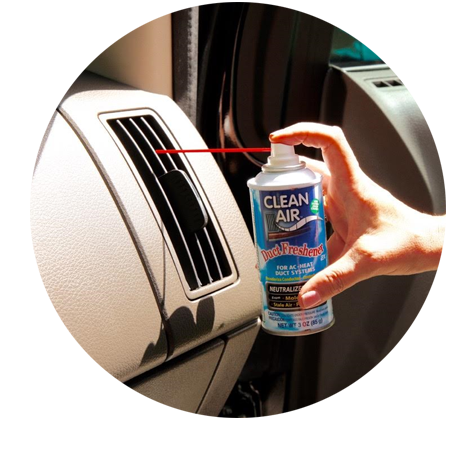 Clean Air® Auto Fogger’s unique odor elimination formula neutralizes on contact, all odors on all surfaces inside your Car, Truck, Boat or RV, as well as washing the air of odor causing contaminants. 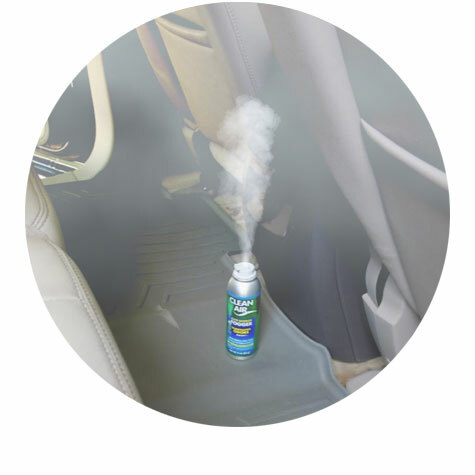 Clean Air’s one step fogging odor treatment is super simple and safely eliminates interior odors like no other product, with a penetrating fog that gets into hidden spaces.